You can buy any of the CDs on amazon by clicking on the link (and amazon will even pay me a few pence if you do actually buy anything!). Read on to find out what I think – I’d also love to know if you have any other ideas, or have heard gossip or rumours! If you’d read this blog before, you might have noticed links to another blog – Musical Top Fives – where I intended to write about musical theatre only, in the form of lists of top fives… I’ve decided that there’s just no real point in keeping the 2 things separate any more (which might also mean that more people read them! )… I’m going to start by re-visiting something I wrote a few weeks back – my 5 favourite musical theatre actresses. I’m actually a little late in noticing this news, so I suspect I’m not the only one… it seems to have taken some time to make it across the sea from the USA, as I haven’t yet seen it on any of the websites that I look at! 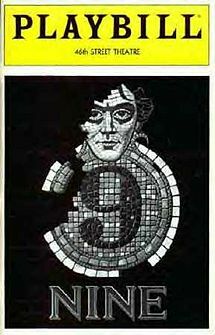 It has been confirmed that Rob Marshall, who directed the film adaptation of Chicago, is turning his hand to another stage-to-film number – this time he will direct Maury Yeston’s Nine.